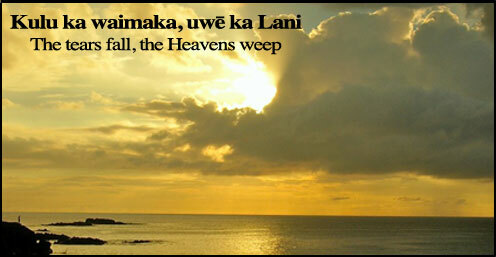 He palapala ho’ālohaloha kēia mai ka `āina o Hawai`i no ‘oukou e ka po`e o `āina o Konekikuka. all of you, the people of Connecticut in this time of your sadness and tragic loss. Na Ke Akua, e hō`olu`olu mai i ko `oukou mau na`au me kona aloha pau`ole. May God comfort your hearts with the blessings of his never ending love. Following our last post of blessings for peace and aloha during this holiday season and sharing positive thoughts for a bright 2013, our spirits are now greatly saddened and our hearts are breaking for the 20 children who suffered such a violent and traumatic end to their young innocent lives in the Newtown tragedy. We offer our blessings to the parents. We share in your grief – all the fathers, mothers, brothers, grandparents, loved ones and friends – for lives cut short. We offer our heartfelt sympathy for your great loss of these precious gifts from God. Here to short and gone too soon these little beings now return to the arms of their Creator. They will never have the chance to blossom but they have grown in the minds of a nation. Their hands will never create anything more than the crayon drawing hanging on the refrigerator of mommy and daddy under a big bright sun but they have painted a vision eyes of a nation. They will never have a chance to make their special mark on the world but they each leave an indelible imprint on more lives than most people ever will. You will never feel their touch again but they have touched the hearts of families all across our nation forever. All the wonderful milestones, sweet memories and tender moments – birthdays, graduation, marriage, hugs that will never happen and the generations lost. Their dreams and your dreams seem broken but do not despair. This tragedy will be a turning point and a step in doing what is pono (right) to protect the children and citizens of this nation. Be comforted in the knowledge that your children are not lost. They take their place as angels embraced and surrounded by Godʻs grace and divine light in His realm where all pain and sorrow are gone. Their lives are not dimmed. Their spirits have sparked the spirit of a nation. Twenty stars now shine eternally in Heaven as bright beacons and guiding lights that stand for strength and fortitude. We pray that all hearts, minds and spirits will be healed and all sorrow, suffering and grief will be replaced by peace. We pray that this tragedy will empower everyone, to be more loving, kinder, more sensitive, and more considerate of their family members. We pray that we all place more time, energy and on the most important thing in life which ohana (family). Celebrate, cherish and honor your children, celebrate, cherish and honor your wife, celebrate, cherish and honor your husband, celebrate, cherish and your parents. Never be afraid to say, “I love you,” and never be afraid to give a hug. It’s the greatest gift anyone can give to another – it’s a priceless treasure – and it costs absolutely nothing. Life is too short not to! Sweet children… sleep in heavenly peace.